The instrument approach procedure (IAP) chart provides the method to descend and land safely in low visibility conditions. The FAA establishes an IAP after thorough analyses of obstructions, terrain features, and navigational facilities. Maneuvers, including altitude changes, course corrections, and other limitations, are prescribed in the IAP. 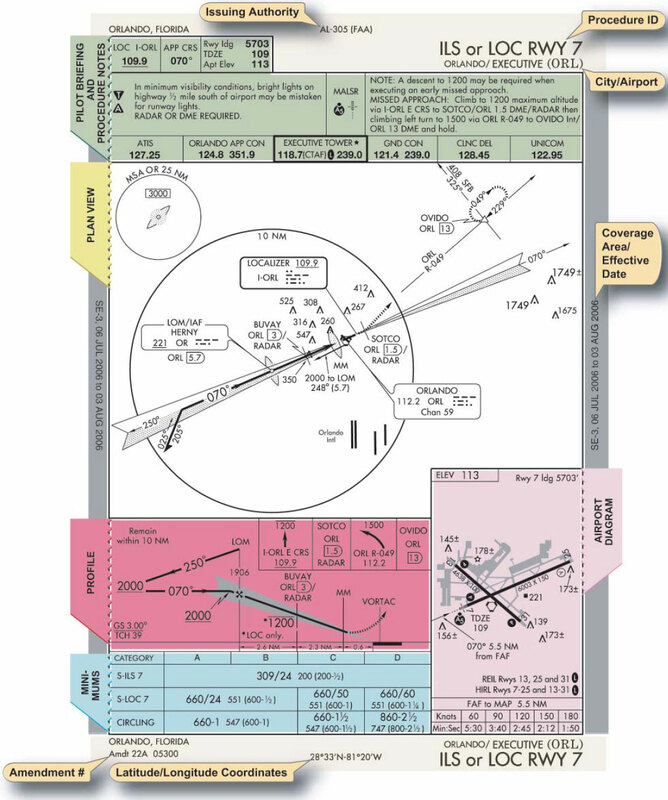 The approach charts reflect the criteria associated with the United States Standard for Terminal Instrument Approach Procedures (TERPs), which prescribes standardized methods for use in designing instrument flight procedures. In addition to the AeroNav Products, other governmental and corporate entities produce approach procedures. The U.S. Military IAPs are established and published by the Department of Defense and are available to the public upon request. Special IAPs are approved by the FAA for individual operators and are not available to the general public. Foreign country standard IAPs are established and published according to the individual country’s publication procedures. The information presented in the following sections highlight features of the United States TPP. The instrument approach chart is divided into six main sections, which include the margin identification, pilot briefing (and notes), plan view, profile view, landing minimums, and airport diagram. [Figure 1-10] An examination of each section follows. The margin identification, at the top and bottom of the chart, depicts the airport location and procedure identification. The civil approach plates are organized by city, then airport name and state. For example, Orlando Executive in Orlando, Florida, is alphabetically listed under “O” for Orlando. Military approaches are organized by airport name first. The chart’s amendment status appears below the city and state in the bottom margin. The amendment number is followed by the five-digit julian-date of the last chart change.“05300” is read, “the 300th day of 2005.” At the center of the top margin is the FAA chart reference number and the approving authority. At the bottom center, the airport’s latitude and longitude coordinates are provided. If a chart is original, the date of issuance can be used instead of the julian-date. The final approach course alignment with the runway centerline exceeds 30º. The descent gradient is greater than 400 FPNM from the final approach fix (FAF) to the threshold crossing height (TCH). When this maximum gradient is exceeded, the circling-only approach procedure may be designed to meet the gradient criteria limits. To distinguish between the left, right, and center runways, an “L,” “R,” or “C” follows the runway number (e.g., “ILS RWY 16R”). In some cases, an airport might have more than one circling approach, shown as VOR-A, VOR/DME-B, etc. More than one navigational system separated by a slash indicates more than one type of equipment is required to execute the final approach (e.g., VOR/DME RWY 31). More than one navigational system separated by “or” indicates either type of equipment may be used to execute the final approach (e.g., VOR or GPS RWY 15). Multiple approaches of the same type, to the same runway and using the same guidance, have an additional letter from the end of the alphabet, number, or term in the title (e.g., ILS Z RWY 28, SILVER ILS RWY 28, or ILS 2 RWY 28). VOR/DME RNAV approaches are identified as VOR/DME RNAV RWY (runway number). Helicopters have special IAPs designated with COPTER in the procedure identification (e.g., COPTER LOC/DME 25L). Other types of navigation systems may be required to execute other portions of the approach prior to intercepting the final approach segment or during the missed approach. The pilot briefing is located at the top of the chart and provides the pilot with information required to complete the published approach procedure. Included in the pilot briefing are the NAVAID providing approach guidance, its frequency, the final approach course, and runway information. A notes section contains additional procedural information. For example, a procedural note might indicate restrictions for circling maneuvers. Some other notes might concern a local altimeter setting and the resulting change in the minimums. The use of RADAR may also be noted in this section. Additional notes may be found in the plan view. When a triangle containing a “T” (see below) appears in the notes section, it signifies the airport has nonstandard IFR takeoff minimums. Pilots should refer to the DPs section of the TPP to determine takeoff minimums. When a triangle containing an “A” (see below) appears in the notes section, it signifies the airport has nonstandard IFR alternate minimums. Civil pilots should refer to the Alternate Minimums Section of the TPP to determine alternate minimums. Military pilots should refer to appropriate regulations. When a triangle containing an “A” NA (see below) appears in the notes area, it signifies that Alternate Minimums are Not Authorized due to unmonitored facility or the absence of weather reporting service. Communication frequencies are listed in the order in which they would be used during the approach. Frequencies for weather and related facilities are included, where applicable, such as ATIS, ASOS, AWOS, and AFSSs.